CoinRoyale offers Bitcoin gamblers a simpler and more effective approach to Bitcoin games that follows the famous line: simplicity is beauty. 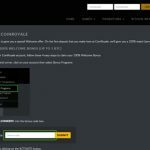 CoinRoyale now introduces itself to the Bitcoin gambling community as one of the more effective Bitcoin casinos in the industry to date. 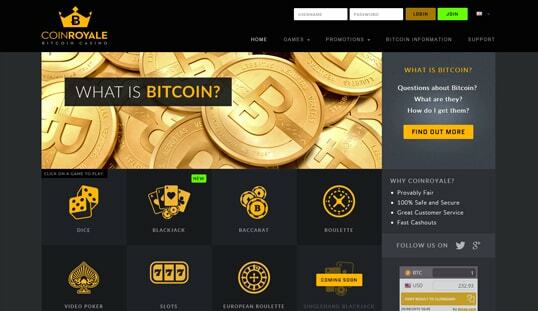 This Bitcoin casino is a concrete example of the cryptocurrency gambling site’s mission to continue to strengthen games and services through the changing demands over time. It debuted on the market in 2013 and has since then undergone continuous revamps until its recent facelift and improvement. It regularly adds new games to its website, which earned it the reputation to become one of the go-to sites for provably fair betting. This Bitcoin casino ignores the game titles developed by various game suppliers in the industry, and it is through this that it stands out. Its games are designed from scratch and exude a familiar design and game philosophy. They are provably fair and are not graphic-extensive. Nevertheless, the games are worth playing, and it also helps that they are simple and pleasing to the eyes without lacking the essentials features. Bitcoin dice, blackjack, baccarat, roulette, video poker, slots, and European roulette are available here, with the singlehand blackjack to be released soon. 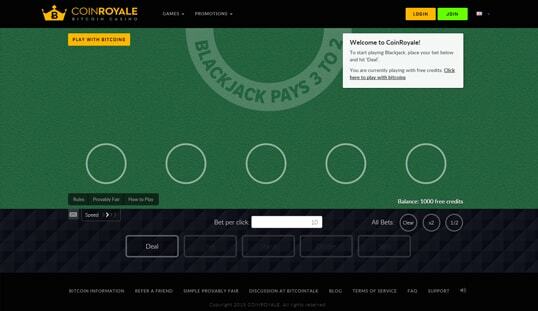 Using proprietary software, CoinRoyale maintains simplicity and a cohesive interface. All the games bear the same design that matches the overall aesthetics of the website. Not only does this promote familiarity, it also presents the brand as the perfect alternative for players who seek for a different Bitcoin gambling environment. Players must register to enjoy the full services of CoinRoyale, and this means that only the members can bet and win Bitcoin. A username, a valid email address, and a preferred password are needed to complete the signup. Meanwhile, those who wish to experience the gaming style offered in this casino can do so through the free credits. Sending deposits can be done by directly transferring the amount to the account’s deposit address or by scanning the QR code using a mobile wallet. Regardless of the preferred option, all deposits must be at least 0.001 BTC. There is no limit to the amount wished to be deposited, and all transactions are credited to the account instantly. Withdrawals, on the other hand, may have short delays but only when the amount is very large. Cashouts must be at least 0.001 BTC. It offers a 100% Welcome Bonus that rewards new players up to 1 BTC. This bonus can be activated upon entering the bonus code in the box shown on the Bonus Programs page. The bonus amount must be rolled over 35 times, and this should be done within 30 days from the bonus activation. Also, only the bets on blackjack, video poker, and slots will count toward the bonus rollover. 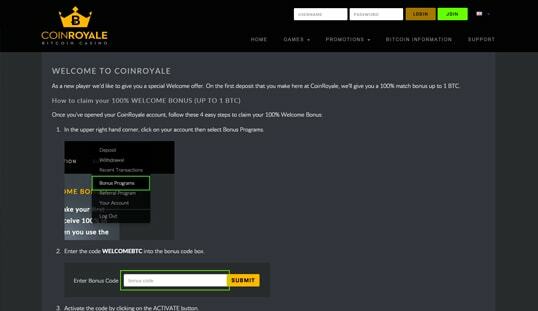 CoinRoyale lacks a live chat support, but it can be contacted through its email address. Players may also share their concerns or issues on the casino’s official Bitcointalk thread.